Today I dropped by MIT to see a demo of Spacewar, the Very First Videogame -- originally written for the PDP-1 in 1962; now reconstructed by GAMBIT for the Arduino. My photos aren't terrifically clear, but you can see the two spaceships maneuvering around a central sun (and its gravity well). They shoot at each other, and that's a videogame. The starry background, famously, is based on actual star charts. The original source code to Spacewar has long been available (here, for example) but it is minimally-commented PDP-1 assembly code and not very accessible. The GAMBIT folks have worked for several months to reverse-engineer the code and figure out what's going on. See their blog posts on the project. GAMBIT has promised (nudge, nudge) to post their marked-up copy of the original assembly, to document what they've discovered. I'll add a link when that happens. If you missed Spacewar today, you should drop by the MIT Museum this Friday evening (5:30 pm); the game will be demoed again. More photos below the dotted line. 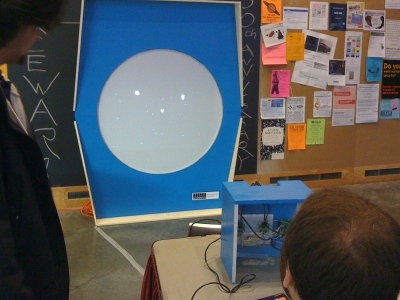 Continue reading Spacewar at MIT. Tags: gambit, history, mit, spacewar. This is the essay I refer to in the video. It really is one of my favorite written works of game-design takeapart. There are still a few unclaimed songs in Kevin’s Apollo 18 IF Tribute Album project. It’s particularly needful of a short work of interactive fiction that would complement the song “Mammal”, but there are a bunch of one-move “Fingertips” games that need to be written as well. The first-draft deadline remains set at February 12. Those who find themselves suddenly inspired to create a They Might Be Giants fan-game at tremendous velocity should feel free to claim a remaining slot and follow the instructions on the original post. Tags: books, if, links, music, videos.